Annabelle: One week and counting! 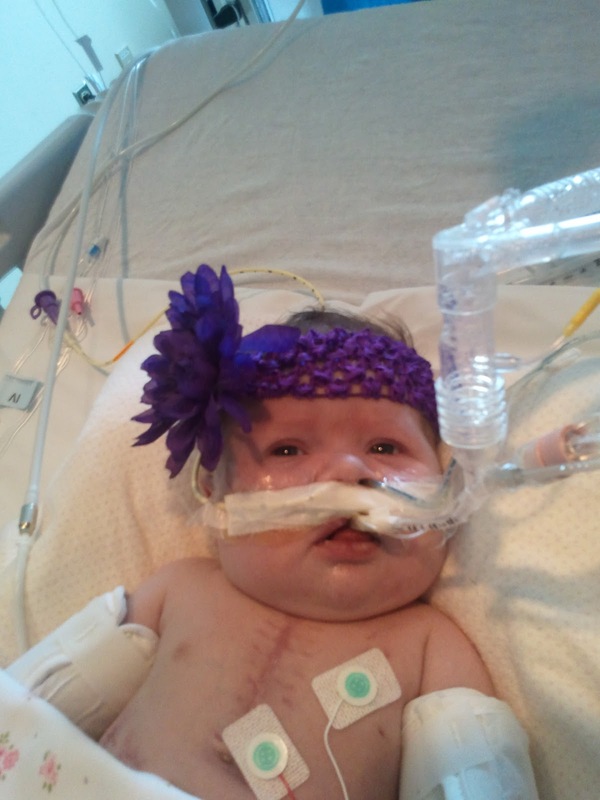 One week from today, on her 3-month birthday, Annabelle will be having her 2nd open-heart surgery. Those cautionary words are what they’ve been using each morning in doctor’s rounds when they talk about the surgery, I’m assuming so I don’t get my hopes up if it gets changed, which is pretty par for course in Annabelle’s past! In the meantime, her CO2 levels haven’t liked to cooperate (they went up >115 the other day… she usually runs in the 60’s or very low 70’s, which is on the high side anyway.) To combat this, they went up on her vent rate, which only helped to bring it down to 85. So they started her on some medicine (starts with a D… have NO clue how to spell it…) and as of her 4:00 a.m. blood-gas, they were down to 70, so WOOHOO for THAT!!! And yes, I like to know numbers. I am a numbers person (on top of a lover of words…) so it helps my analytical mind to process!! She’s also had PH issues… but those seem to be getting better too. She also ran a fever night before last, so they did blood/urine cultures and found an infection in her pee. Not sure if that means a bladder or UTI infection, but it is one of the two and she is being treated with 3 different antibiotics. One doctor also mentioned that she might have a very slight infection in her respiratory track or lungs, but her Xray looks fine. Antibiotics should help that too if it’s there. The other day, I was talking with a co-worker about “how” I was coping with this. To be quite honest, when I really sit down and analyze myself (I’m wierd… I know…) I think I’m doing okay. I have good days where I’m superwoman and CAN DO THIS, but then I have bad days where I just want to fall apart and sleep all day and live in a pretend world where nothing is wrong. This, I think, is pretty normal. I hope so anyway…. I’m also flip-flopping between a strong belief that God is with Annabelle and that everything is going to be fine, to the reality that bad things do happen and that there is a real possibility that Annabelle might never come home. Thus comes in our conversation. My co-worker’s concern is that normally, I’m a very optimistic person, and during our conversations lately I’ve been more pointing out the scary possibilities. I truly believe that if you live in the scary what-if’s of life, you’re going to be miserable. I choose to think positive… even though I’m occassionally disappointed when my positive thinking doesn’t pan out. But with Annabelle, it’s harder. I read other mom’s and dad’s blogs and see that Christian parents aren’t immune to their baby’s dying. Sometimes God chooses to heal our little ones in a way we would not choose. I look at my Annabelle, and I get scared sometimes. So, what I told said co-worker is this: I’m learning that I can’t believe in circumstances with this. I just have to believe in God. Instead of dwelling on what might be or might not be, I have to dwell on the One who will always be. I fail daily. I am a work in progress and am trying. This doesn’t mean I don’t pray for my baby’s healing. I beg God for it daily. But my peace comes not through his answer, but through his daily goodness and strength. Because by God’s goodness, Annabelle is here today, and I can still love on her today. That’s what I focus on. I think your balance is completely normal and sensible. It's often the people who haven't had these hard things happen that would have a parent to act "happy" all the time as if that would control the situation. Reading how you deal with Annabelle's ups and downs is really an encouragement to me. It's real and it's human, as is the issue at hand. Wow. Thank you for sharing your heart. This was a beautiful post Krista. You have an amazing testimony, Krista, keep fighting, don't give up. God is ALWAYS there. Cyber hugs to you, Krista, as you deal with the day to day challenges you're facing. Your faith is inspiring. I think it's healthy that you realize your emotions will vacillate and aren't trying to deny or ignore your feelings. The Lord, when He walked among us, embraced his. He wept, so we can weep, knowing He fully understands what we're going through. May you feel His arms around you in the darkest hours when He cradles you to Him. I think you're doing beautifully. Doubts and fears are normal, and your testimony of faith in the One who holds us all in His care, is uplifting. Keep running to Him. He won't let you fall. Thank you for keeping us updated on Annabelle's progress. *update* Doctor's confirmed she has a UTI (are very concerned how that happened…) and a lung infection. Surgery will depend on how fast her lung infection goes away, we are hoping it isn't delayed!! Funny: they wanted to do surgery early since being on the vent causes higher risk of lung infection. Go figure! I think that you could fall apart and you're not. You're trusting God and being strong. I'm praying for all of you and hope her infection clears up quickly. I think you are handling things with grace and faith. I'm praying for your sweet one, she is adorable! I continue to add you and yours to my prayer list. You really are an inspiration Krista.